It takes a special kind of crazy-brave to write a novel about domestic violence that makes the reader feel sympathy for the perpetrators, and it takes a remarkable level of skill to create one that I am interested in reading. But as I predicted when I read Josephine Rowe’s short story collection Tarcutta Wake (see my review) this debut novel fulfils the promise of arresting characterisation. 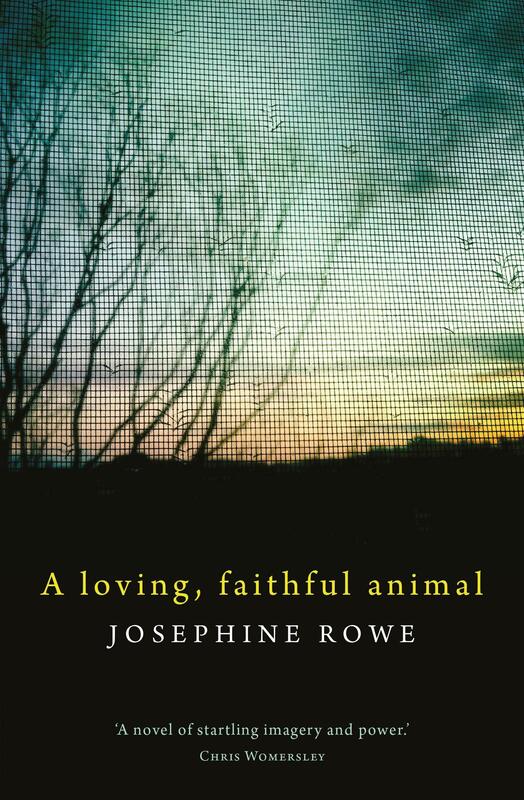 A loving, faithful animal is a multifaceted dissection of dysfunctional family life with unexpected moments of humour and a keen perception of Australian larrikinism as it plays out among young people in Australian country life. It’s a very good novel indeed. I don’t know why we even bothered, Lani says, only for you to hear, as you climb down from a chair to take charge of the ornaments. She’s right. Apart from the bike, Christmas was the same tired cracker jokes and picking at a cold Safeway chook while the TV murmured to itself disconsolately in the lounge. Lengths of red and gold tinsel wound round the antenna only made things worse. The bike has been restored by Uncle Tetch, younger than Ru’s absent father and missing the index fingers of both hands since he cut them off to avoid the Vietnam draft. He’d heard it said – of men their father’s age, of men from other wars – how so-and-so never made it back. Not to mean that so-and-so had died over there, or even that he’d left pieces of himself behind in the gangrenous pits dug by makeshift hospitals. Rather that a different man had come back in so-and-so’s place, riding in his body and speaking in his voice, but staring out through the mask of his face as if with a different set of eyes. It is this capacity for rendering small details that gives Rowe’s writing its ferocious power. Jack is a man who still cups his cigarette to hide its glow from the enemy, long, long after his war is over. When his kids are little he can control his anger with a walk down a long dusty Australian bush road, but despite the cocktail of tranquilisers that Lani steals to sell at parties, it gets harder, and the walks turn into absences of increasing length. Lani used to go hunting for him, her kids not understanding why, and would drag him home from sad and seedy boarding places. But is this time for good? How can the victims of his violence know? Their last family activity was a grisly treasure hunt, searching for the remains of Belle, a loving, faithful animal found torn to bits by a predator not of the Australian bush. Ru now prefers to love the bike, a non-living thing, resting [her] hands between its handlebar horns as though it is a loving, faithful animal. This is a splendid debut, subverting the tired old genre to create a nuanced portrait of a family in search of redemption. Highly recommended. Review copy courtesy of UQP. Available from Fishpond A Loving, Faithful Animal and good bookstores everywhere.